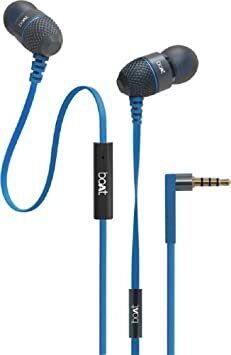 The lowest price of boAt BassHeads 220 Wired Headset With Mic ( Black ) is at Flipkart where is it is for INR 0. This price is INR 669 lower than the other price for the product. The prices for the product change across variants. The price for boAt BassHeads 220 Wired Headset With Mic ( Black ) is valid across Bangalore, Hyderabad, Chennai, Mumbai, Delhi, Pune and Kolkata. The boAt BassHeads 220 Wired Headset With Mic ( Black ) is available at best price of INR 0 on Flipkart. Pros: 1. Bass (Device dependent) 2. Highs 3. Inbuilt Mic (multipurpose button) 4. Wide Range of ear buds. 5. Tangle free flat cable. Cons: 1. Not so comfortable fitting. 2. Earpiece feels cold during winter(metal body) 3. Average sound quality. 4. Buds dont fit easily on earpiece. Those who want better sound quality and durability, go for Soundmagic ES18 for 100 bucks more.